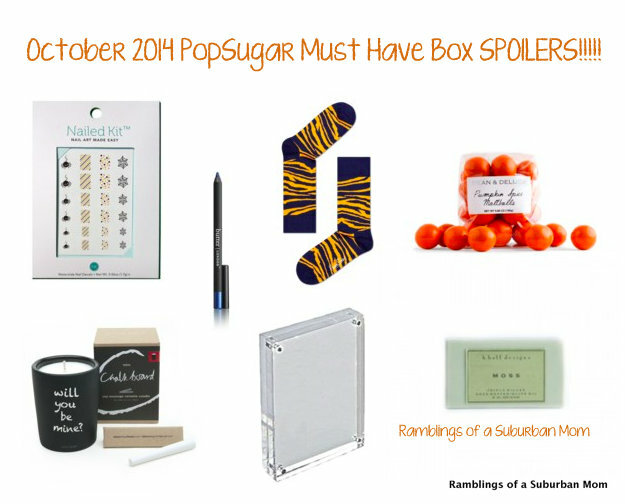 POP SUGAR OCTOBER 2014: COMPLETE SPOILERS AND GIVEAWAY UPDATE! Although I’m not personally a subscriber to Pop Sugar, I’m sure many of you lovelies are or are at least curious about this subscription, so I thought I’d share the complete spoilers for the October box along with a promotional code to save $5 on the box if you’d like to purchase it. Now, I’m looking at these spoilers and thinking maybe I should add Pop Sugar to my repertoire of subscription boxes. Those socks are Uh-dorable, and anything from Dean and Deluca is usually a huge win in my book…and then with the candle, the nail sticker art in time for Halloween festivities, and that uh-mazing looking soap? Looks like it’s a box full of WIN! GIVEAWAY UPDATE: TWO MORE ITEMS TO BE ADDED LATER TODAY!!!! Until next time, stay beautiful and good luck to all of you who are entering the giveaway.